Premier Wedding Car Hire offers the latest Luxurious Wedding cars hired for all occasions our New Rolls Royce Phantom Car hire and our latest Rolls Royce Phantom Ghost Car. The Rolls Royce Phantom is truly an elegant and unique luxury car. Rolls Royce themselves describes the Phantom’s presence as being a statement of affluence. The Phantom fuses hand crafted traditional coach building with state-of-the art technology to make an automobile unlike any other. The Rolls Royce Phantom is the most stunning and impressive car. This truly stunning and imposing vehicle is perfect for all occasions. Whether it be for School Prom Hire, Birthday, Stag Night, Hen Night, Airport transfer, Royal Ascot or Wedding Car Hire, The Rolls Royce Phantom is truly the statement of all occasions. 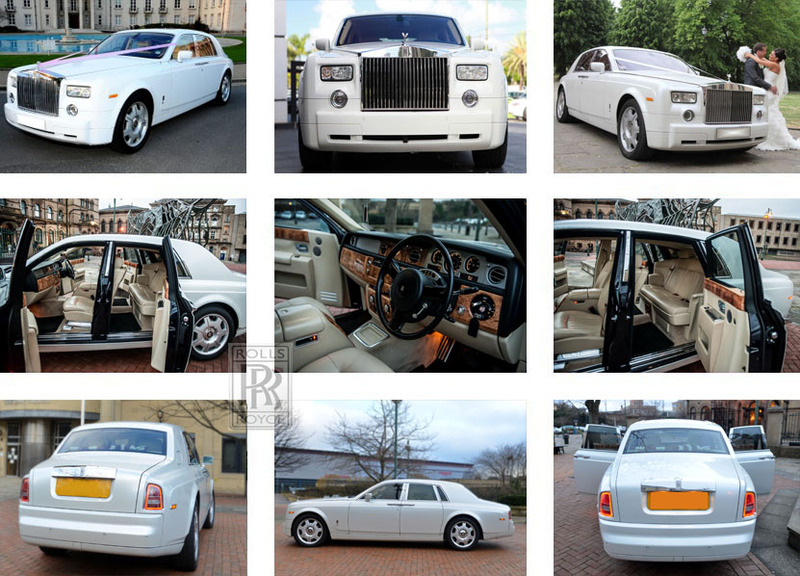 You can choose from the white Rolls Royce Phantom car hire or the new Rolls Royce Ghost car hire. The pearl white Phantom reflects the sunlight beautifully, making the car seem even more vast and imposing. The Rolls Royce Ghost on the other hand is an amazingly modern car. The Rolls Royce Phantom hire is everything you would expect of a Rolls Royce; comfort, style and effortless sophistication. You are assured of a classy and an amazing entrance to your prom, birthday, wedding or even at a drop to the airport. Whatever the occasion travel in style with our Rolls Royce Phantom car hire. Premier Rolls Royce Phantom hire will ensure your special occasion is truly memorable. Arguably the finest car on the planet, hiring a Rolls Royce Phantom is the ultimate statement of class and style. The latest generation of Rolls Royce builds on the heritage and history of this amazing marque. Popular events covered with the Rolls Royce Phantom include: Birthday Rolls Royce Hire, School Prom Rolls Royce Phantom Car Hire, Birthday Rolls Royce Phantom Hire, Airport transfer Rolls Royce Phantom, Royal Ascot Rolls Royce Phantom, Rolls Royce Phantom Wedding Cars. ARRIVE IN STYLE & BOOK YOUR ROLLS ROYCE PHANTOM TODAY! Premier Limousines Company is a trading name of Platinum Limousines Ltd and is purely used for marketing purposes only.